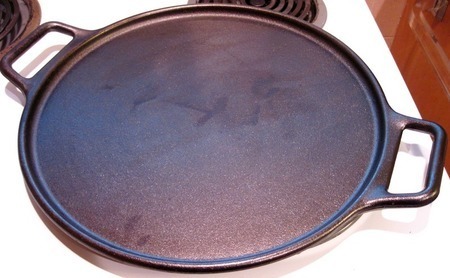 If that is a Lodge Cast Iron, then I have a similar cast iron. I do not have a pizza stone or steel yet and I wondered if it would work as well for the recipes from the The Pizza Bible. It worked wonderfully! I put the freshly slapped and spread dough onto the room temperature cast iron, spread the sauce, sprinkled the cheese, placed the pepperoni and sausage, and put it on to the top rack of the oven. The cast iron accomplishes the same goal as a flat steel or stone - heat the pizza efficiently and evenly. If you were going to make numerous pizzas, then I could see how you would want a peel and a flat stone or steel to get the pizzas on or off more easily. I am definitely going to get more equipment as my budget allows. I must confess, I broke one "Tony's 10 Commandments of Pizza" and used just one cast iron. However, I did rotate it and move it from the top of the oven to the lower part of the oven to effectuate the even cooking of toppings and crust. It was delightful to have made something so beautiful and delicious! I am going to be working through every recipe over time. Anyway, it will work, just crank up the oven for an hour and rotate from the top rack to the bottom rack about half-way through the cycle. The picture is of a New Yorker style pizza from The Pizza Bible. It was all possible thanks to Tony's and the Pizza Bible's instructions! Yea I used it last night and loved it. But I didn't move it up or down in the oven. The crust came out a little too dense though. I've used stone, steel and cast iron (the flat top of an old lodge Dutch oven). Steel is the most efficient of the three. Before I had the steel, I'd start the bake on the cast iron, then move the pizza to the stone for the finish. My sense was that the iron was a slightly better conductor of heat than the stone. Experiment with the two and see what works best in your oven. The most important thing is to completely heat the stone, steel or cast iron before you put pizza on it--you want to get that quick conduction of heat and the resulting rise from the dough when you place the pizza on the surface. That heating usually takes 40 minutes to an hour. And it makes all the difference. 1. Better conductor of heat. They are extremely heavy though. If you go with a stone, get the thickest one you can find, and go for a rectangle. It's easier to place a circle on a square, and will be easier to work with.